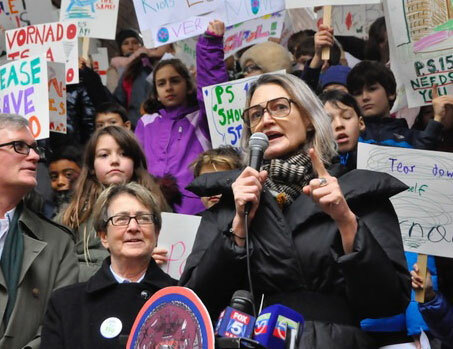 Tonight (Thursday, April 11) Manhattan Youth will celebrate a slew of recent Downtown victories related to schools and education, when it confers its 2019 Community Awards on a lineup of local leaders. Among the leaders being recognized tonight is Tricia Joyce, chair of the Youth and Education Committee of Community Board 1 (CB1). Ms. Joyce has been a zealous advocate for a broad array of issues related to local schools for more than a decade. But the most recent victories she helped bring to fruition involved Millennium High School, in the Financial District. A high performing school, Millennium is harder to get into than Yale University, according to a 2017 statistical analysis by the New York Times. This desirability has contributed to Millennium suffering from overcrowding for years. Ms. Joyce led a yearlong push to convince the Department of Education (DOE) to lease an additional floor in the building that Millennium occupies, a demand that the schools agency capitulated to in March. At the same time, Ms. Joyce was spearheading a campaign to convince the City’s Department of Transportation (DOT) to install a speed bump on South William Street, outside of Millennium’s front door. This followed a 2017 incident in which a student was run over by a taxi and thrown to the ground, inflicting severe bruising, and causing multiple injuries to her mouth. DOT insisted that it had an ironclad policy of never authorizing speed bumps in the middle of a block, which is where the school’s entrance is located. In January, almost two years to the day after the student was run down, DOT relented and agreed to install the speed bump. Also slated to be honored this evening are the husband-and-wife team of Buxton and Lisa Midyette, parents at P.S. 150 who helped organize and lead campaigns that saved the school twice. 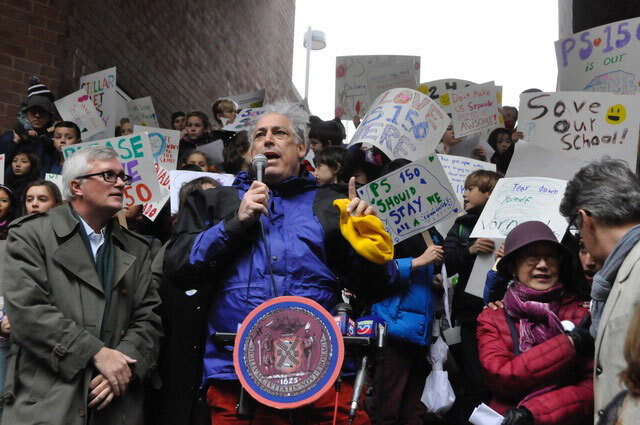 The first near-death experience came in 2013, when the DOE decided to shut down the school the following year, and fold it into a new school in Chelsea. After a grassroots mobilization that included parents, children, and elected officials, the DOE backed down. But in 2018, they attempted to shutter the school once again, with a plan that would have moved it temporarily to the Peck Slip School, and then migrated its students once again, to a new building now under construction in the Financial District. An even more vociferous campaign was launched, which included (among other tactics) children sending thousands of handwritten postcards to stockholders in the company that owns the building occupied by P.S. 150. Once again, DOE gave the school a reprieve. The most recent push to save P.S. 150 was spearheaded by Anshal Purohitand Jonah Benton, both parents at the school. (Ms. Purohit is the co-president of the school’s Parent-Teacher Association, and Mr. Benton serves as its Treasurer.) Both will also receive awards at tonight’s ceremony. This evening’s spotlight will also be shared by 27 participants in Manhattan Youth’s Teens in Community Service program, who volunteer time to help with everything from swim programs, to summer camps for middle-school students, to staffing the Downtown Community Center. The 2019 Manhattan Youth Community Awards will be held at the Downtown Community Center (120 Warren Street, near the corner of West Street) tonight, starting with an Honoree Reception at 6:30 pm, followed by the Community Awards Presentation at 7:00 pm. Light refreshments will be served. Tickets are priced at $10 in advance (via EventBrite.com), or $15 at the door. All funds raised will be used to support Manhattan Youth’s Scholarship Fund.